However, when it came time for Draper to read the post, the prosecution did not stop there. Draper was asked to stop after reading the word ‘McVeigh.’ She was asked who that was, and then asked to clarify who it was. It was done over more objections by the defense. The Bunkerville Retrial in Las Vegas continued today with Judge Navarro’s bias being highlighted for the world to see. The day was filled mostly with time outside of the jury presence, going over Facebook posts that were offered for evidence. Both sides had their say on why they did/did not want the evidence admitted. Facebook evidence is highly controversial. There are too many variables within Facebook to guarantee that a post was made by a particular person. The prosecution wants to show that this attitude of “conspiracy’ continued long after the Standoff was over. They want the jury to believe that the dissidents were recruiting based on their belief that they had won against the government. The prosecution, and Judge Navarro have taken it too far. Not only are the admitting posts made during the Standoff, but they are gathering posts made up to 2 years after. They are including information on protests in Oregon and Montana that took place months and years after the Bunkerville Standoff. These are unrelated to this case and should not have been allowed. The defense presented very good reasoning, but the judge overruled the defense and the memes, posts and pictures were allowed. This included multiple repeated pictures, most notably of Eric Parker lying prone on the Northbound bridge on April 12, 2014. Not only was every angle shown, but the same photos were allowed if they came from different sources. The photographer, someone’s Facebook page, someone else’s Facebook page, a news media outlet, etc. If they were able to download the same picture from a half-dozen sites, they wanted to show it a half-dozen times. This was allowed over the “cumulative” objections by the defense. The prosecution also attempted to include all of the defendants booking photos. Each defendant had multiple photos, to include each tattoo, if any, and of course in their orange jail scrubs. The defense was successful in arguing these photos down to two photos. Eric Parker and Scott Drexlar each have tattoos depicting the Idaho III% group. The photos were cropped to show just these tattoos. FBI Special Agent Sarah Draper was on the stand to authenticate and admit the evidence. A particular post from Eric Parker’s Facebook page was to be read by Draper. This was a fairly long post in which the prosecution redacted a couple of words. There had been a reference to the “Miller’s,” in which Parker praised the vetting process at the Sugar Pine Mine for not allowing anyone into the scene that were like the Miller’s. This was redacted. What was not redacted was a reference to “McVeigh.” The defense team made every attempt to get that post from being admitted but Judge Gloria Navarro wanted it to be read to the jury. However, when it came time for Draper to read the post, the prosecution did not stop there. Draper was asked to stop after reading the word ‘McVeigh.’ She was asked who that was, and then asked to clarify who it was. It was done over more objections by the defense. 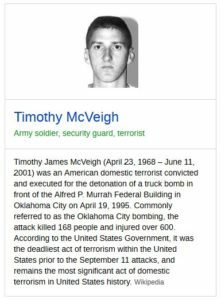 Draper told the jury that Parker was referencing ‘Timothy McVeigh’ and that he was the ‘Oklahoma City Bomber’ and he blew up an office building inn Oklahoma City. This was enough to connect the four defendants to McVeigh, when there was no mention of these details in the post. It was all conjecture on the part of the FBI agent and the prosecution. Is county commissioner from Colorado violating ethics with environmentalist lobbying?